This article reviews ETX as a binary options broker. 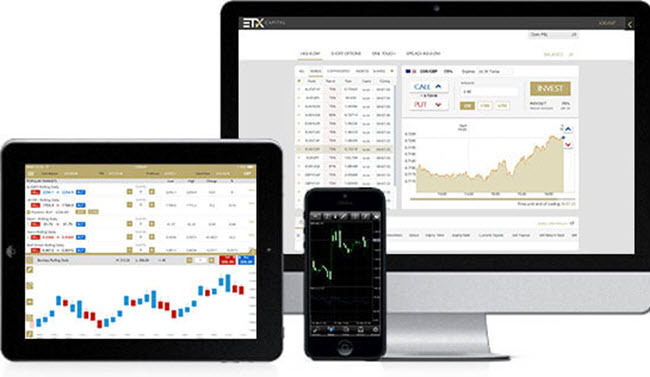 If you want to know more about ETX as a forex broker then I recommend that you visit this website. The London-based online broker ETX Capital offers binary options based on commodities, foreign currency, indices and stocks. The largest selection of underlying assets in found in the forex category, but ETX Capital has a lot of offer commodity binary options traders as well. There is no withdrawal fee for your first four (4) withdrawal requests each calender month. This is a great service, since it means that you can make approximately one withdrawal per week without paying any withdrawal fees. The company is based in the United Kingdom and regulated by the British Financial Conduct Authority (FCA). Long-term binary options available in addition to the standard fare. The trading platform is actually easy to use, but can be a bit overwhelming at first glance. We suggest you use the demo account to familiarise yourself with the platform and play around a bit before you change into real-money trading. The asset and options list is located on the left hand side of the trading platform. If you for instance want to have commodities as your underlying assets for binary options, this is where you make that choice. Once you have made your basic selections, the price graph will update automatically to the right. You can now make adjustments, e.g. when it comes to expiry time. Above the price graph, you will find buttons for adjusting the stake level. High/LowWill the asset price be higher than the current strike price when the option expires? Spread High/LowHigher risk, but also the potential of a higher reward. Some of these binary options at ETX pay out 100% when they finish in the money. Mobile trading apps are available for Android (from version 3.0.0 and up) and iOS. All the binary options available for browser trading are available in the mobile app as well, so you don’t risk missing any trade opportunities by visiting ETX through the app. Accepting banking methods include debit cards, credit cards and wire bank transfer. The minimum deposit is 100 GBP. There is no withdrawal fee for your first four (4) withdrawal requests each calender month. For additional withdrawals, you pay a 10 GBP withdrawal fee per withdrawal. Withdrawal requests through bank transfer are typically processed within 3 days, while withdrawals to a debit or credit card tend to take 4 days to process. Your ETX account will be deemed dormant if you have funds in it but no trades have been placed over 120 days. For dormant accounts, ETX charges a monthly 15 GBP “dormancy fee”. Educational materialETX traders have access to a wide range of training materials, including webinars. Seamless integration of MT4 PlatformThis is good news for advanced traders, especially those who carry out technical analysis. ETX is chiefly famous for their spread betting and Contracts for Difference (CDF) offers, but have a lot of interest available to the binary option trader as well – including binary options based on commodities. The company is based in London and regulated by the British Financial Conduct Authority (FCA). Their license number is 124721. Among other things, FCA have strict requirements when it comes to the protection of client funds.